Offering a choice of four models in the Quantum range, Piovan will demonstrate what has made these blenders an immediate success at PDM 2018. Visitors to stand D036 can find out more about the range, incorporating models designed for entended application and flexibility with capacity ranging from 1 to 800kg/hr and offering industry 4.0 connectivity. 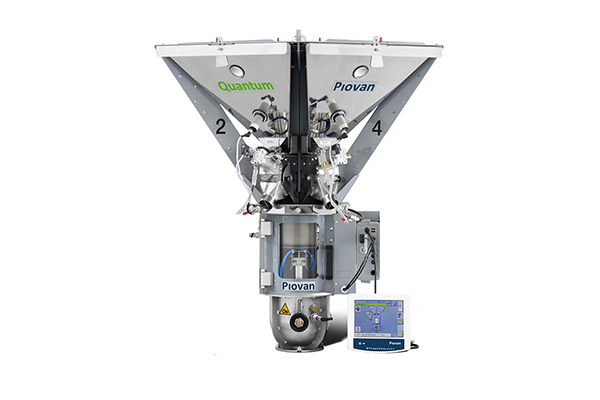 Quantum is the range of gravimetric blenders designed by Piovan, the world leader in the production of ancillary equipment for the plastics processing industry. Quantum blenders have been an immediate success, embodying innovations that radically changed the way injection moulding machines and extruders are fed. Flexibility in use, digital and mechanical protection of data, excellent weighing precision and blend uniformity, proprietary control system, integration with Winfactory 4.0, patented design, high energy and operational efficiency: these are just some of the tangible advantages the range guarantees. Today Piovan offers 4 models in the Quantum range. The smallest Quantum blender, the Q7, has a capacity ranging from 1 to 70 kg/h. The capacity of the Q12, launched at the same time Q7, is up to 150 kg/h. These two models can also be used for very low capacities: they maintain a very high level of precision at 10 or 20 kg/h. The range includes the models Q50 and Q80. The first has a maximum capacity of 550 kg/h, while the second 800 kg/h. Both permit greater flexibility in use and high precision even at small capacities. While the Q50 allows the operator to manually remove the dosing stations and switch them, the very weight and size of the stations prevent this on the Q80, which belongs in the category of essentially “central” blenders. Precision is the keyword for the entire Quantum range, which today means these blenders have been setting new benchmarks. The design of the mixer, also patented, ensuring consistent results in terms of blend uniformity. Today the Quantum mixer is the only one on the market that prevents separation or layering of ingredients of different specific weights. The Quantum models, from the Q12 on, integrate the option of remote mixer, individual – for each dosing station – or multiple – in this case feeding a number of mixing stations separately. All of these distinctive and unique technical characteristics of the Quantum blenders guarantee the maximum precision not only for high-tech applications (for example medical or electronic components), but also in other sectors, where the production capacities required are higher and where precision is the factor that makes the difference: for example in packaging, in the production of hoses or of textile fibres – for bags or flexible containers with a high degree of mechanical resistance (which depends on the quality of the blend). Another important application is the production of caps and closures. In this case, the blend which requires the addition of masterbatch is a critical element of the process. When the closure is translucent, namely coloured but transparent, minimal variations in material blending – below 1% more or less – visibly affect the final result.